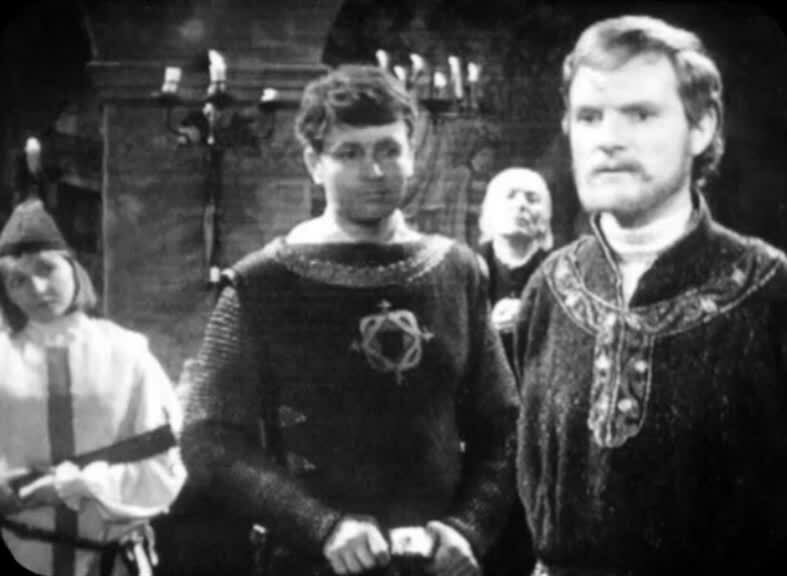 The Wheel of Fortune is the best episode of The Crusade and it has several moments of special interest, such as Haroun’s life story as told to Barbara, the conversation between Leicester and the Doctor and the confrontation between Richard and Joanna. Haroun (George Little) lives for one reason only – to kill El Akir. He describes to Barbara the reason why. HAROUN: Last year my house was a fine and happy place. A gentle wife, a son who honoured and obeyed me, and two daughters who adorned whatever place they visited. Then El Akir came to Lydda and imposed his will. He desired my eldest daughter Maimuna, but I refused him. BARBARA: So he took her? HAROUN: Yes. When Safiya and I were away, he came and burned my house. My wife and son were put to the sword. It’s a perfectly pitched and dignified performance by George Little. Whilst the character invites our sympathy, Little never overplays – instead he allows the script to do the work. Equally good is Petra Markham as Safiya. Her father has never explained what happened to the rest of their family, but she has faith that all will be well. “It is a strange mystery. They’ve gone away and we must simply wait for their return. It is the will of Allah“. Jacqueline Hill is so good in these scenes – listening in horror to Haroun’s story and also when she nearly reveals the truth to Safiya about her missing family. Another key moment is when Haroun leaves Safiya in Barbara’s care. He leaves his knife behind and insists that she use it to kill Safiya and then herself if they’re discovered by El Akir’s men. Barbara is appalled (“No. Life is better than this.“) but Haroun is insistent. It’s another well played moment from Hill which helps to reinforce just how cruel El Akir must be. The spat between the Doctor and the Earl of Leicester (John Bay) is a very interesting one. It’s another of Whitaker’s lovely Shakespearian pastiches that Hartnell and Bay both deliver with aplomb. Although the Doctor usually takes the moral high ground, he doesn’t really have it here. His dismissal of Leicester as having no brain doesn’t seem at all fair. Leicester is a soldier, trained to fight, and it’s difficult to argue with his statement that “armies settle everything”. And as Richard’s plan wasn’t recorded in the history books, the Hartnell Doctor, who at this stage was insistent that “you can’t rewrite history, not one line”, would have surely known that the love-match was doomed to end in failure. LEICESTER: Sire, with all the strength at my command I urge you, sire, to abandon this pretence of peace. DOCTOR: Pretence, sir? Here’s an opportunity to save the lives of many men and you do naught but turn it down without any kind of thought. What do you think you are doing? LEICESTER: I speak as a soldier. Why are we here in this foreign land if not to fight? The Devil’s horde, Saracen and Turk, posses Jerusalem and we will not wrest it from them with honeyed words. DOCTOR: With swords, I suppose? LEICESTER: Aye, with swords and lances, or the axe. DOCTOR: You stupid butcher! Can you think of nothing else but killing, hmm? LEICESTER: You’re a man for talk, I can see that. You like a table and a ring of men. A parley here, arrangements there, but when you men of eloquence have stunned each other with your words, we, we the soldiers, have to face it out. On some half-started morning while you speakers lie abed, armies settle everything, giving sweat, sinewed bodies, aye, and life itself. DOCTOR: I admire bravery and loyalty, sir. You have both of these. But, unfortunately you haven’t any brain at all. I hate fools. Saladin and Saphadin discuss the marriage proposal. Saladin is extremely cautious. Have England, France and all the rest come here to cheer a man and woman and a love match? No, this is a last appeal for peace from a weary man. So you write your letter and I’ll alert the armies. Then on either day, the day of blissful union or the day of awful battle, we will be prepared. And sadly, that’s the last we see of Saladin and Saphadin as they, along with Joanna, don’t feature in the final episode. This does give The Warlords something of an anti-climatic feel, but we’ll discuss that in more detail next time. When Joanna learns that Richard plans to marry her off to Saphadin, it’s fair to say that she’s not pleased. The scene is a thrilling moment, as both Julian Glover and Jean Marsh attack it at full-throttle. It’s hard to find many examples of Doctor Who scenes pitched at such a level – which probably makes this one all the more special. JOANNA: What’s this I hear? I can’t believe it’s true. Marriage to that heathenish man, that infidel? RICHARD: We will give you reasons for it. JOANNA: This unconsulted partner has no wish to marry. I am no sack of flour to be given in exchange. RICHARD: It is expedient, the decision has been made. JOANNA: Not by me, and never would be. RICHARD: Joanna, please consider. The war is full of weary, wounded men. This marriage wants a little thought by you, that’s all, then you’ll see the right of it. JOANNA: And how would you have me go to Saphadin? Bathed in oriental perfume, I suppose? Suppliant, tender and affectionate? Soft-eyed and trembling, eager with a thousand words of compliment and love? Well, I like a different way to meet the man I am to wed! RICHARD: Well, if it’s a meeting you want. JOANNA: I do not want! I will not have it! As this is the last surviving episode of the story, it’s worth taking a moment to praise Douglas Camfield’s direction. He always had an eye for unusual angles and some of the caps below are good examples of how he arranged the actors in interesting configurations (some in the foreground and others in the background, for example). It helps to make the frame more interesting than just having them stand in a line (something many other directors would have been content to do). Barbara is back in El Akir’s clutches at the end of the episode (and it’s the second that’s ended with Barbara in peril). El Akir’s final words here are truly chilling, thanks to Walter Randall’s matter-of-fact delivery. If El Akir had been an eye-rolling villain then it would have been easier to discount his threats. It’s his calmness that’s somewhat disquieting. The only pleasure left for you is death. And death is very far away. Richard’s in something of a better temper at the start of this episode – in part this is due to the Doctor’s wily manoeuvrings. It’s also interesting to note how the Doctor has easily lapsed into the speech patterns at Richard’s court, he’s started throwing “methinks” around quite casually! RICHARD: There is a jest here, albeit a grim one with our friends dead. But Saladin must be just as much out of temper over this affair as we are. DOCTOR: Your messenger might offer to exchange a hundred prisoners for the knight he holds. RICHARD: We think we value Sir William highly. We do, but it would not be good to let Saladin know. DOCTOR: He might think you undervalue his men. One hundred men to one of yours. Methinks a fair bargain, sire. RICHARD: By my father’s name, you have wit, old man. Guard, call the Chamberlain. We recognise the service you have rendered us and will be pleased to see you in our court. 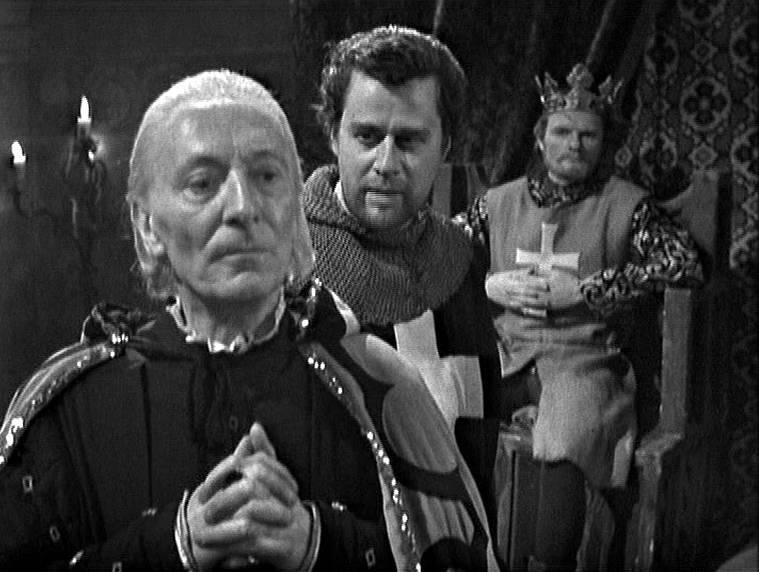 With the Doctor and his friends in Richard’s debt, this allows Ian (once he’s been knighted as Sir Ian, Knight of Jaffa) to begin his quest to find Barbara. This also handily removes William Russell from the main storyline (and he’s on holiday next week, so only appears briefly on film). When a story rich in plot-threads like The Crusade only lasts four episodes, it can be a problem finding things for everybody to do, so this simplifies matters – the Doctor and Vicki remain at court and Barbara finds herself in the clutches of El Akir. Saladin sends me presents of fruit and snow when I am sick, and now his brother decorates you with his jewels. Yet with our armies do we both lock in deadly combat, watering the land with a rain of blood, and the noise of thunder is drowned in the shouts of dying men. The notion that Saladin’s brother, Saphadin, is captivated by Joanna (Jean Marsh), Richard’s sister, sets the King thinking. Could this be a way to bring the war to an end? He sets about drafting a proposal, although crucially, he doesn’t think to speak to Joanna first. And not only this kingdom, its towns and fortresses, shall be yours, but also the Frankish kingdom. Our sister, the Princess Joanna, whose beauty is already spoken of wherever men of judgement and discernment are, is a fit match for one who not only enjoys so grand. No, not grand, eminent. So eminent a brother as the Sultan Saladin but who also possesses an element of his own. Prince Saphadin, we beg you to prefer this match and thus make us your brother. Richard is pleased with this and takes the Doctor and his friends into his confidence and this helps to bring them back into the main narrative. A story like this, focusing on the machinations of Kings, will inevitably tend to sideline the Doctor – although this isn’t something that David Whitaker necessarily had a problem with. He was of the opinion that when the Doctor traveled back in time he should be content to be merely an observer and not interfere. Dennis Spooner (as can be seen in The Romans and The Time Meddler) had the opposite view, so this story (written by Whitaker, script-edited by Spooner) could be seen as something of an uneasy compromise between the two. But even if the Doctor is something of a passive figure here, he does have some fun by bamboozling his adversaries. There’s another fine example in this episode, as we see the Doctor runs rings around the unfortunate Chamberlain. DAHEER: Visitor of sorrows, depriver of my children, robber of my goods. DOCTOR: Who is this? Do you know? VICKI: No. Oh, his face is a bit familiar. CHAMBERLAIN: You stole some clothing. CHAMBERLAIN: You see this riding habit? It was taken from this very room. Now it is back here again. DOCTOR: And a pretty poor garment, too. CHAMBERLAIN: This and this, stolen from me. DAHEER: And stolen from me. DOCTOR: Yes, now there really is a point there, isn’t there? If I stole from you, my lord Chamberlain, how could I steal from him? DAHEER: You did. You did steal from me. DOCTOR: Then how could I steal from him, eh, you blockhead? CHAMBERLAIN: Please, please. Now, I had the clothes first. DOCTOR: Oh, how nice for you. DAHEER: And I had them second. VICKI: Did you buy them? DOCTOR: Then whoever it was stole them from you must have sold them to you. Now, don’t you agree? The episode ends with Barbara escaping from El Akir’s guards. She runs through the streets of Lydda, desperate for a hiding place. But will she find friend or foe? I can’t have been the only person to have the cockles of their heart warmed by the prominent sight and sound of William Hartnell in the new BBC Christmas trailer. 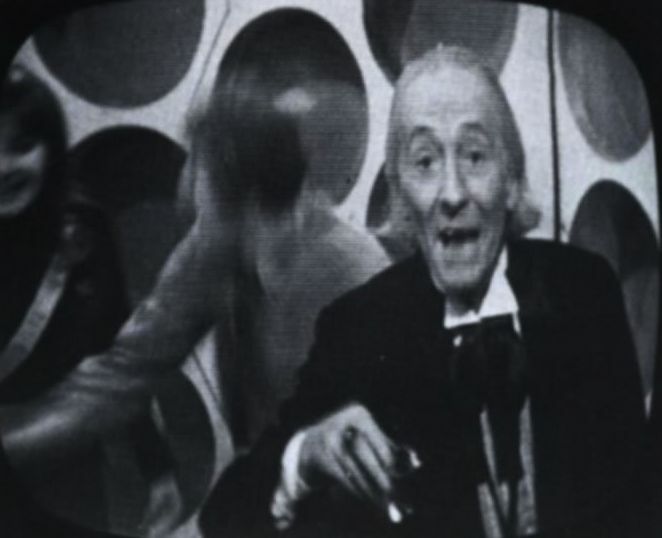 Of course, if they hadn’t wiped the tapes some forty years ago then we wouldn’t have had to have a shot of Hartnell from The War Machines matched up with audio from The Feast of Steven, but as it’s the season of goodwill we’ll let that pass. That brief clip of Billy wishing everybody the compliments of the season made me think that The Feast of Steven would be an ideal addition to my Christmas television viewing. I wouldn’t normally watch an individual episode of Doctor Who, but let’s be honest – The Feast of Steven has no connection to the rest of The Daleks’ Master Plan, so why not? Indeed, as others have noted in the past, The Daleks’ Master Plan is a curiously constructed story. The beginning and the end of the serial can be said to form one story, whilst the episodes in the middle are essentially The Chase Part Two. And since it’s debatable whether The Chase was a good idea to begin with, the notion of a sequel is an interesting idea. Within this second story, sits The Feast of Steven, an odd episode (yes, a very odd episode) all on its own – broadcast on Christmas Day 1965. The fact it was broadcast on Christmas Day must explain the tone of the episode. Presumably it was felt that 25 minutes of the Daleks exterminating all and sundry would be out of place – so instead we have something much lighter. It’s difficult to believe that the original plan was to have the cast of Z Cars appear in the first section, but if they had it would have been a bizarre crossover, more in the nature of a Children in Need skit than a normal episode of Doctor Who. But it does give us one of Hartnell’s best lines, when the Doctor describes himself as “A citizen of the Universe, and a gentleman to boot”. After the Doctor, Steven and Sara extract themselves from the clutches of the police, the TARDIS drops them in the middle of Hollywood’s golden age, where they rub shoulders with the likes of Charlie Chaplin and Bing Crosby. This section of the story is probably not best served by the lack of visuals (you can be sure Douglas Camfield would have had a few tricks up his sleeve). There are a few memorable lines, though some (like Hartnell’s “Arabs”) are memorable for the wrong reasons. And it ends with that line from the Doctor, wishing everybody at home a Happy Christmas. A Hartnell ad-lib or something scripted? I’m not sure, but I do find it bizarre that some recons (although fortunately not the LC one below) have removed it. This seems to be similar to snipping out the fast-talking Ogron (“no complications”) from the Day of the Daleks SE. Don’t they know that you can’t re-write history, not one line?